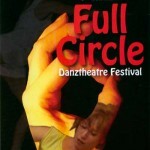 Chicago Danztheatre Ensemble’s 4th annual Full Circle Danztheatre Festival premiered February-23, 2007 at the Hamlin Park Studio Theatre in two separate programs with 16 of Chicago’s most innovative dance and dance/theater companies. Poster Child examined the choice to live in the here and now. Gina Cornejo showed the second in which a life changes direction. Diandra Jones’ light-heartedly poked fun at the charismatic American politician: “It’s no wonder the nation marched whole-heartedly behind them into one historical catastrophe after another.” Other works included Perceptual Motion, INC., RTG Dance, Lindsey Marks, Nina Corwin and Erin Rohberg. Chicago Danztheatre Ensemble’s Allyson Esposito presented a touching journey through the loss of a relationship to finding the ability to stand strong. Soul Theatre portrayed a battle between two beings that inhabit one skin. Christy Munch choreographed a dance within a dance that spun around the notion of finding the exact essence of life. Erin Carlisle Norton explored the themes of self with a hint of guardedness and curiosity. Working Class Theatre discovered the moment of finality. Leah Raffanti demonstrated how women relate to each other on a physical and metaphysical level. Other works featured Thread Meddle Outfit and Zephyra.